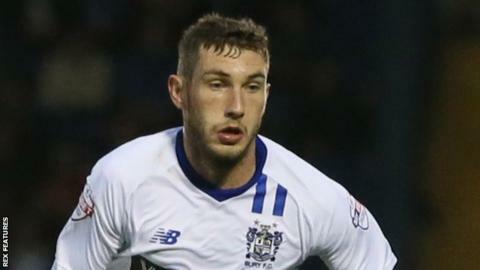 Bury sealed their League One status as Danny Mayor's second-half header helped them to victory against Swindon Town. Leon Clarke could have given the visitors the lead from close range before the break but Robins keeper Jake Kean pushed the ball over the bar. The Shakers went ahead when Craig Jones crossed in to the onrushing Mayor, who nodded the ball past Kean. Jonathan Obika nearly sealed a point for the hosts late on, but his 20-yard curling shot hit the crossbar. The result means Bury remain in 15th place in the League One table, but are 12 points ahead of Blackpool in 21st, who have just three games left to play. Swindon stay in 16th place and are six points ahead of Blackpool with four games still to play. "A well deserved three points, you'd expect for them to rally, with 7,000 fans behind their effort once they had gone a goal down. "For 70 minutes my team looked like they wanted to win, looked like they wanted to score, but in the first half we just let ourselves down. "Once we scored they had an energy with our performance and they caused us a few problems but I'm delighted with the win that we were so desperately seeking." Match ends, Swindon Town 0, Bury 1. Second Half ends, Swindon Town 0, Bury 1. Attempt saved. Nathan Thompson (Swindon Town) header from the centre of the box is saved in the top centre of the goal. Attempt saved. Yaser Kasim (Swindon Town) left footed shot from the right side of the box is saved in the centre of the goal. Jonathan Obika (Swindon Town) hits the bar with a left footed shot from outside the box. Attempt missed. Michael Doughty (Swindon Town) right footed shot from outside the box misses to the left. Corner, Swindon Town. Conceded by Craig Jones. Substitution, Bury. Ryan Lowe replaces John O'Sullivan. Michael Doughty (Swindon Town) hits the left post with a left footed shot from the centre of the box. Attempt missed. Nicky Ajose (Swindon Town) right footed shot from the centre of the box misses to the right. Attempt blocked. Danny Mayor (Bury) right footed shot from the centre of the box is blocked. Substitution, Bury. Reece Brown replaces Dan Gardner. Attempt missed. Jonathan Obika (Swindon Town) right footed shot from outside the box misses to the left. Goal! Swindon Town 0, Bury 1. Danny Mayor (Bury) header from very close range to the bottom left corner. Assisted by Craig Jones with a cross. Attempt saved. Jonathan Obika (Swindon Town) right footed shot from outside the box is saved in the bottom left corner. Substitution, Swindon Town. Yaser Kasim replaces Ellis Iandolo. Nathan Thompson (Swindon Town) is shown the yellow card for a bad foul. Attempt missed. John O'Sullivan (Bury) right footed shot from outside the box is high and wide to the right.